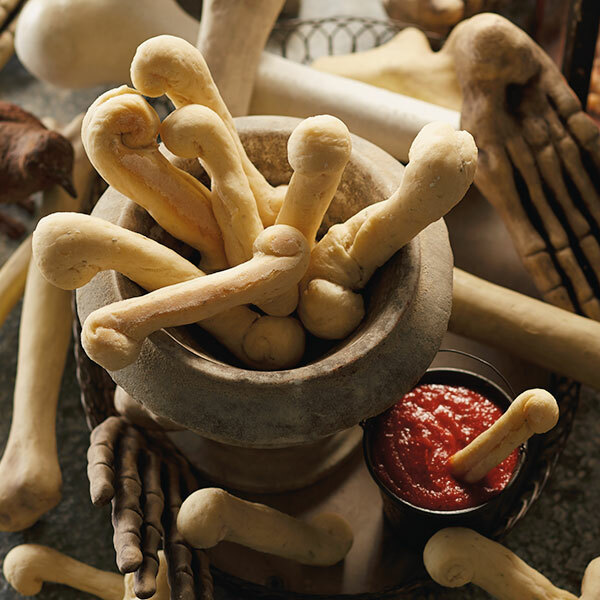 This homemade breadstick recipe is a great example of taking an everyday favorite and reimagining it as a creepy Halloween treat. Dem Bones can serve as an appetizer for Halloween gatherings or a twisted snack for classroom parties. You can make them ahead and freeze them. Thaw them in a warm oven on the day you need them. Marinara sauce makes the perfect "bloody" dipping sauce. In a large bowl, sprinkle yeast and sugar over warm water. Let stand until foamy, about 5 minutes. Add lemon zest, salt, rosemary, 2 Tbsp. oil and 1½ cups flour. Beat with an electric mixer about 3 to 5 minutes, until dough is glossy and stretchy. Slowly add 1 cup more of flour, enough to form a soft ball of dough. Place dough onto a lightly floured surface and knead until smooth and springy-about 10 minutes-adding more flour as needed to prevent sticking. Or use an electric mixer with a dough hook on high until dough pulls away from the bowl and is springy-about 5 to 7 minutes-adding flour 1 tablespoon at a time as needed to prevent sticking. Turn dough out onto a generously floured flat surface. Pat into a 6 inch square. Brush dough with remaining 1 tsp. olive oil and cover with plastic wrap. Let rise until puffy, about 45 minutes. Spray 3 large cookie sheets with cooking spray and coat with flour, tapping off excess. Using a sharp knife, cut dough lengthwise into 4 equal sections. Working with 1 section at a time, cut dough into 8 equal pieces. Stretch each piece to about 10 to 13 inches long. Form the ends of each piece into 2 rounded shapes so that it looks like a long cartoon dog bone. Place on a floured cookie sheet. Note: Vary the lengths of each piece so your bones don’t all look the same. Repeat Step 6 with the remaining dough, placing the bones on the baking sheets about 2 inches apart. Bake in a 350° F oven 20 to 25 minutes or until golden brown. Rotate baking sheets after 10 minutes for even browning. Cool on wire rack. Serve with marinara as a “bloody” dipping sauce. Tip: These can be made ahead of time and frozen. Thaw them out in a warm oven on the day you need them.